Research background: Increased regulations reducing systemic risk are essentially underpinned by the understanding of the global nature and sources of instability of the financial system. In the economic literature, there are many arguments presented by critical supporters and opponents of measuring and reporting global systemically important entities. Purpose of the article: In response to the requirements of regulators, the article seeks to identify systematically important regulated stock markets for selected global stock exchanges by developing a composite ratio. Additionally, it provides empirical evidence concerning their risk exploration. Methods: The proposed method uses weighted average values of indicators grouped in four categories: (1) market size, (2) cross-jurisdictional activity and interconnectedness, (3) substitutability, (4) complexity. The research covers stock exchanges, reported to WFE, spanning the period 2008–2017. Findings & Value added: The study finds that the problem of systemic risk on global stock exchanges is growing despite numerous prudential regulations. In order to obtain a more complete assessment of market systemic sensitivity, regulators should take into account a wider range of indicators and calculations such as cross-jurisdictional activity and market complexity. Adrian, T., & Brunnermeier, M. (2011). CoVaR. NBER Working Paper, 17454.doi: 10.3386/w17454. Barth, J., Prabha, A., & Swagel, P. (2012). Just how big is the too-big-to-fail problem. Journal of Banking Regulation, 13. Bijkerk, W., Tendulkar, R., Uddin, S., & Worner, S. (2012). Systemic risk identification in securities markets IOSCO Staff Working Paper, 1. BIS (2013). Global systemically important banks: updated assessment methodology and the higher loss absorbency requirement. BIS (2014). The G-SIB assessment methodology – score calculation. Boss, M., Elsinger, H., Summer, M., & Thurner, S. (2004). An empirical analysis of the network structure of the Austrian interbank market. Oesterreichische Nationalbank Financial stability report. June. CGFS (2016). Objective-setting and communication of macroprudential policies. CGFS Papers, 57. 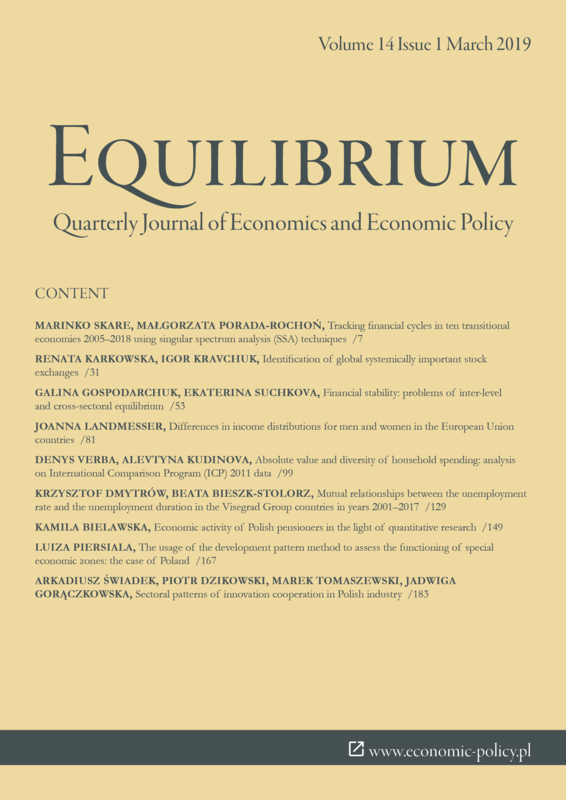 Claessens, S. (2014) An overview of macroprudential policy tools. IMF Working Paper, 214. doi: 10.5089/9781484358115.001. Craig, B., & Von Peter, G. (2010). Interbank tiering and money center banks. Journal of Financial Intermediation, 23(3). doi: 0.1016/j.jfi.2014.02.003. Degryse, H., & Nguyen, G. (2007). Interbank exposures: an empirical examination of contagion risk in the Belgian banking system. International Journal of Central Banking, 3(3). doi: 10.2139/ssrn.1691645. EBA (2014). Guidelines on the criteria to determine the conditions of application of Article 131(3) of Directive 2013/36/EU (CRD) in relation to the assessment of other systemically important institutions (O-SIIs). ESRB (2013). Recommendation on intermediate objectives and instruments of macro-prudential policy. European Parliament and European Council (2014). Directive on markets in financial instruments and amending Directive 2002/92/EC and Directive 2011/61/EU (MiFID II). Fang, L., Chen, B., Yu, H., & Qian, Y. (2017). Identifying systemic important markets from a global perspective: Using the ADCC ∆CoVaR approach with skewed-t distribution. Finance Research Letters, 24. doi: 10.1016/j.frl.2017 .08.002. Fang, L., Sun, B., Li, H., & Yu, H. (2018). Systemic risk network of Chinese financial institutions. Emerging Markets Review, 35. doi: 1016/j.ememar.2018 .02.003. Forbes, K., & Rigobon, R. (2002). No contagion, only interdependence: measuring stock market comovements. Journal of Finance, 57. doi: 10.1111/0022-1082.00494. Fricke, D., & Lux, T. (2015). Core-periphery structure in the overnight money market: evidence from the e-MID trading platform. Computational Economics, 45(3). doi:10.1007/s10614-014-9427-x. FSB, & IOSCO (2015). Assessment methodologies for identifying non-bank non-insurer global systemically important financial institutions. FSB, IMF, & BIS (2011). Macroprudential policy tools and frameworks. Update to G20 Finance Ministers and Central Bank Governors. FSB, IMF, & BIS (2016). Elements of effective macroprudential policies. Lessons from international experience. Galati, G., & Moessner, R. (2011). Macroprudential policy – a literature review. BIS Working Papers, 337. doi: 10.1111/j.1467-6419.2012.00729.x. Gravelle, T., & Li, F. (2013). Measuring systemic importance of financial institutions: an extreme value theory approach. Journal of Banking and Finance, 37(7). doi: 10.1016/j.jbankfin.2013.01.007. Hong, Y., Cheng, S., Liu, Y., & Wang, S. (2004). Extreme risk spillover between Chinese stock market and international stock markets. China Economic Quarterly, 3. Huang, X., & Zhou, H., & Zhu, H. (2009). A framework for assessing the systemic risk of major financial institutions. Journal of Banking and Finance, 33. doi: 10.1016/j.jbankfin.2009.05.017. IMF, BIS, & FSB (2009). Guidance to assess the systemic importance of financial institutions, markets and instruments: initial considerations. In ’T Veld, D., & Van Lelyveld, I. (2012). Finding the core: network structure in interbank markets. Journal of Banking and Finance, 49. doi: 10.1016/j.jbankfin .2014.08.006. Iori, G., De Masi, G., Precup, O., Gabbi, G. & Caldarelli, G. (2008). A network analysis of the Italian overnight money market. Journal of Economic Dynamics and Control, 32. doi: 10.2139/ssrn.841607. Kao, W. S., Kao, T. C., Changchien, C. C., Wang, L. H., & Yeh, K. T. (2018). Contagion in international stock markets after the subprime mortgage crisis. Chinese Economy, 51(2). doi: 10.1080/10971475.2018.1447822. Kroszner, R., & Strahan, P., (2011). Financial regulatory reform: challenges ahead. American Economic Review, 101(3). Langfield, S., Liu, Z., & Ota, T. (2014). Mapping the UK interbank system. Journal of Banking and Finance, 45. doi: 10.1016/j.jbankfin.2014.03.031. López-Espinosa, G., Moreno, A., Rubia, A., & Valderrama, L. (2012). Short-term wholesale funding and systemic risk: a global CoVaR approach. Journal of Banking and Finance, 36. doi: 10.1016/j.jbankfin.2012.04.020. Morales, L., & Andreosso-O’Callaghan, B. (2012). The current global financial crisis: do Asian stock markets show contagion or interdependence effects? Journal of Asian Economics, 23. doi: 10.1016/j.asieco.2012.09.002. Puhr, C., Seliger, R., & Sigmund, M. (2012). Contagiousness and vulnerability in the Austrian interbank market. Oesterreichische Nationalbank Financial Stability Report, 24. Roengpitya, R., & Rungcharoenkitkul, P., (2011). Measuring systemic risk and financial linkages in the Thai banking system. Systemic Risk, Basel III, Financial Stability and Regulation. doi: 10.2139/ssrn.1773208. Ryan, S. (2008). Accounting in and for the subprime crisis. Accounting Review, 83. Schoenmaker, D. (2014). Macroprudentialism. London: CEPR Press. Walesiak M., & Gatnar E. (2009) Statystyczna analiza danych z wykorzystaniem programu R. Warszawa: Wydawnictwo Naukowe PWN. Yu, H., Fang, L., Sun, B., & Du, D. (2018). Risk contribution of the Chinese stock market to developed markets in the post-crisis period. Emerging Markets Review, 34. doi: 10.1016/j.ememar.2017.10.006.